Scientific responsibility of the article belongs to the author. 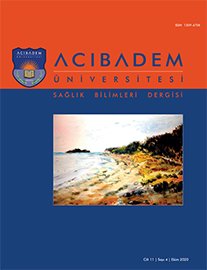 Articles must be submitted online to http://acibadem.dergisi.org/submit . An article, which has been published previously in a scientific publication, is not eligible for publication in our journal. A study, which has been presented either as an oral or poster presentation previously, should be indicated with its date and location down below the title page. Submitted articles are initially reviewed in terms of journal’s standards. An article that does not comply with the journal’s format, is returned back to the author without any further evaluation. Therehore, in order to prevent any unnecessary time and effort loss, authors are advised to review journal’s guidelines carefully. Articles, which are deemed to be in compliance with journal’s standards, are forwarded to at least two Reviewers for their expert opinions on whether the articles are eligible for publication or not. The articles that are approved, are re-evaluated by the Editorial Board to determine publication location and quantity. Advisory and Editorial Boards have authorization to check and make revisions. Futhermore, the publisher is also authorized to make revisions and ask for structural changes about the article and they can as well make reductions by informing the authors. Maximum time period permitted to authours for changes and corrections, is 1 month; within that time period, articles are not included in publication schedule. Articles should be printed with Times New Roman and 12 point font size. The article file should respectively contain Turkish title, keywords, English title, English keywords, the text, references, tables – being one on each page and footnotes of the figures (if any) on the last page. Additionally, a running title, that consists of 3 to 4 words, should be included, to be used on the pages following the title page. The text file should not contain, authors names, institution information, figures and pictures used in the article. Turkish and English summaries should be presented with the text title. Summaries should be divided into Purpose, Methods and Materials, Results and Conclusions and should not exceed 250 words. Keywords must be consistent with Index Mediscus: Medical Subject Headings and Turkish Science Terms Dictionary. Keywords that are consistent with Index Medicus MeSH vocabulary, are also added during typesetting stage by our journal. Case presentation summaries should be brief and single paragraph long. Case presentation summaries should predominantly contain information about the case. The other chapters of the text are (iii) Introduction, (iv) Methods and Materials, (v) Results, (vi) Discussion and (vii) References. There is no requirement for any other chapter of the text, other than the title page, to begin from a separate page. Case presentations should be organized as introduction, case(s) and discussion, following the title and summaries. Authors may solely indicate the references, which they have refered to directly, on their studies. Our journal certainly does not tolerate citing of the references used in other studies. If a reference is believed to be “not through original”, then the author is asked to provide the first page(s) of the reference or references in question. The references, which are not verified by the authors, are extracted during typesetting stage. References, which have not been published or which cannot be verified by page numbers, (unpublished congress, symposium, meeting and etc.) will not be listed in the ‘references section’. Article: Tanyeri H, Pamir N., Modern Medicine Education and New Century Physicians, Acibadem University Medical School Journal 2009;1:1-5. Congress Abstracts: Bengtsson S, Solheim BG. Enforcement of data protection, privacy and security in medical informatics. In: Lun KC, Degoulet P, Piemme TE, Rienhoff O, editors. MEDINFO 92. Proceedings of the 7th World Congress on Medical Informatics; 1992 Sep 6-10; Geneva, Switzerland Amsterdam: North-Holland; 1992. p. 1561-5. Book: Guttman L., Spinal Cord Injuries: Comprehensive Management and Research 2nd Edition. London: Blackwell Scientific Publications, 1976: 353-4. Book Chapters: Sherlock S, Dooley J. Hepatic Cirrhosis in Diseases of the Liver and Biliary System. Sheila Sherlock and James Dooley Eds. 11th. Edition, London, Blackwell Science Ltd. 2002, pp. 365-80. Tables, figures and charts should not be presented within the text. Tables should be included in the forwarded text file – being one table on each page; yet, all the figures, charts and photographs should be compiled in an image file (jpeg or gif) and forwarded separately. Tables’ titles and figures’ footnotes should not be missing. Explanations about the figures should be added to the very end of the text file. The places of the tables, figures and charts in the text should be indicated. Word and reference limitation in scientific articles: The limitations are as follows: For original articles – 2500 words and 30 references; for compilation articles – 3500 words and 50 references; for case presentations – 1000 words and 10 references. Review: This kind of manuscript can only be accepted by the special invitation of the Editor. Interesting images: (Physical examination findings about the diseases, radiological images, pathological slides and etc.) can be presented with brief texts and high resolution images. Texts should not exceed 300 words and must have maximum 5 references. Letters to The Editor: These are the writings composed in the nature of criticism and/or contribution about previously published contents in the journal. It should not contain summary and should not exceed 400 words. Acknowledgment (if any): Acknowledgement of appreciation is allowed for those who had significant contribution to the preparation of the article or the study. In the articles, which present the results of the experimental studies done on humans, there must be a sentence indicating that the volunteers or the patients, who have been subject to this study, have consented to the study after they were notified and informed of the specifications of the procedures completely. When such study is in question, authors should specify that they have complied with the internationally recognized guidelines and with the ‘Guidelines about Pharmaceutical Studies’ that was implemented by Turkish Republic Health Ministry and published on Federal Register on 01/29/1993, edition 21480 and also with other guidelines and provisions indicated in the texts published afterwards, and they must forward the approval obtained from the related Ethics Committee. Also, permits must be obtained for the studies performed on animals, and the article must clearly explain what has been done to avoid any pain, ache or discomfort for animals. If the patient’s identity is to be revealed by a photograph, then there must be written consent of the patient and his/her eyes should be concealed with tape. Plagiarism: Regardless of one’s intention, plagiarism is a serious violation. If an article, without providing any reference, displays similarities with another study, that is considered plagiarism. In case of plagiarism indication, either before or after the article is approved or after it was published, author is given an opprtunity to prove otherwise. If the meetings with the author are not satisfactory, article is withdrawn and it is not permitted to be re-published for the period of time determined by the Editor-in-chief. Prior to publication process, journal executes authenticity check for all the articles to verify their contents’ authentication. Online articles are submitted in two separate parts by following a 10-step procedure. First 8 steps respectively cover information such as article type, institutions, authors, title, summary, keywords, cover letter and etc. 1st step : Article’s type and category are chosen. 2nd step : The institutions of the authors, whose names are on the article, are entered. If all the authors are from the same institution, then one entry would suffice. Institution names should not be abbreviated. 3rd step : Authors’ names, last names and e-mails are written. Additionally, institution names of the authors are checked by cross reference with the institution names in the previous step. Also, the author in charge of all the correspondences about the article is indicated in this tep. It is mandatory to fill-out the e-mail box for the author in charge of correspondences. It is not mandatory for other authors. Author names should not be abbreviated. 4th step : Article’s title is written. If the title includes special characters (such as ? , ß, µ), it will be enough to click on that character shown on the table. 5th step : This is the step for article summary. The summary should not exceed 200 words if it is a case presentation or compilation and 250 words if it is a research article. In research articles, summaries can be laid out with the subtitles of introduction, material and method, findings and conclusion. 6th step : This is the step where the keywords are entered. Keywords in English should be selected by accessing to MeSH link shown on this window. 7th step : In this step, information about the publication of the article in a different journal or its presentation in a congress, is provided. 8th step : At this point, article identification is complete. This step is providing article’s text, videos and figures. Text file should not contain any figures other than the tables. Therefore, e.g. : You have an article that contains one picture and one chart; this means you will complete whole ‘file sending’ process in 3 steps (text file, picture file and chart file). Pictures and videos (if any) need to be sent first. There cannot be any figures in the text file. All the pictures, charts and other figures should be sent one by one with the names (picture 1, chart 2 and etc.) which they were referred to in the article. You can use any writing editor of your preference for the text file (Word, notepad, wordpad and etc.). Whereas, if your text is containing a table, then you should use MS Word. Since, the detailed information about the article’s identification is provided previously, the text file SHOULD NOT contain information about article’s authors, institutions, contact address and etc. The presented files’ names should not recall author or institution names. The presented text files can be viewed one minute later, after they were converted to PDF format. Therefore, file size information and connection are not accessible within that time period. 9th step : After the article is forwarded, there is a field to review details of the article and to inquire about the transactions that were supposed to be carried-out in the previous steps. Up to this step, it is possible at any point to click on ‘previous/back’ option and return to the previous pages and make changes. Article writing can be paused at any stage and can be returned to later to continue from that point. Clicking on ‘send article’ button on the 10th and last step, will forward the article to journal management. Thus, the article is transferred from ‘Incomplete-Sending Articles’ section to ‘Sent Articles’ section. It is not allowed to make any changes on the articles in that section. Authors can check to see the article’s editorial evaluation process phase. Yet, when the editor asks for a revision, your article is tansferred from ‘Sent Articles’ section to ‘Articles Asked For Revision’ section. In this section, it is allowed to make changes on the article. Click here for Copyright Transfer Form.